I really was not going to write anything about this because I try to avoid controversy and not spend time on negative things or people. I am super supportive of all home and online business owners (including bloggers & direct sellers). The content of this article along with the comments really was just a sad example of how women fail to support each other and I think there are a lot of lessons all parties can learn from this. First, I truly believe that everyone has a right to their opinions and a right to express them. I am grateful for this right as well. Second, I agree with some of her points. Yes, there are and have been direct sales and MLM companies that have been scams and pyramid schemes. Yes there are a lot of consultants who do not know how to market or don’t really care about helping people. Yes there are way too many consultants just adding people to groups and spamming and slamming their friends on social media with ads, ads, ads. I dislike being added to the groups and typically leave them too. I dislike seeing so many direct sales reps slam and spam their friends, family, even on their business pages and groups. I get that most are just excited, some are even (sadly & wrongly) taught to do that, some just don’t know anything about marketing and are just trying to do their best, some are brand new and don’t know any better but yes it bothers me too. It’s not just direct sales reps making these marketing mistakes. I see bloggers and all kinds of companies and business people doing the same things all the time. There are a lot of things she said that I do NOT agree with and that are untrue. First of all, MLM is NOT the same as direct sales. It’s a common misconception but there are differences between MLM / pyarmid schemes and LEGIT direct selling companies from their requirements, compensation plan structure and business models. Direct Sales has helped countless of women (and men) change their lives whether it be financially or through gaining confidence and friendships for the past 70+ years. You can read my about story here to see how I was able to go from broke & unemployed to full-time working from home CEO of Me in just 6 months and still nearly 8 years later going strong because of direct sales. I personally know hundreds of people (and am in networking groups with thousands more) who make a great part time and full-time income (many over 6 figures a year) through direct sales. They do it the right way and represent good, legitimate companies. There are many, many wonderful direct sales reps who do love what they do and love helping others. They have learned the proper way to market. They do understand that Marketing is NOT about selling, that it is about building relationships and helping others get products they want, need and love. I teach and coach all the time about the right way to market and about being authentic and genuinely focused on helping others. First, I just personally don’t understand the desire to hurt or having a lack of concern about the damage that words like that can do. Hey if you don’t care for direct sales then okay, just don’t purchase it, don’t go to parties, don’t promote it. There’s no need to spew hatred and try to incite your readers to do the same or try to hurt someone’s desire to just build their own business or make an income. Your about page says you hope to provide a “breath of fresh air for millions of imperfect parents.” There was no fresh air in this post. What about writing a post about 5 Tips for Direct Sales Reps to be better Online Marketers to teach and help them instead? As a blog with a very large following you guys have an opportunity to influence a lot of people and it would awesome to see something more positive come out of this and your site in the future. Read my article to learn How to Be Friends with someone in Direct Sales / Network Marketing & How Direct Sellers Can do Better with Sharing their Business with their friends. Second, bloggers & any online marketer (coaches, information products, personal development, authors, crafters, etc…) do the same thing that direct sales consultants do just in a slightly different way. Sure most bloggers probably are not adding people to groups or direct messaging them about visiting her blog but bloggers promote their own products, other companies and have advertisements on their sites that bring them an income from pageviews, clicks and sharing on social media. Share your thoughts & opinions, your products and other products with as many people as possible online to make an income. Different platform, similar methods, same desired outcome. One profession is not better than the other. One method or platform of a home or online business is not better than the other. One person who is a blogger is not better than a person who is a direct seller (and vice versa). Lumping all direct sales and MLM reps into this category of horrible, pushy, greedy scammers based on your experiences would be the equivalent of me saying that all mommy bloggers are mean, hateful bullies based on reading your blog. Neither of those statements are true. Direct Sellers, focus on building relationships & remember the 80/20 rule on social media. Share helpful information 80% of the time, advertise only 20% of the time. Build relationships with people, get to know them, get to know their needs, ask how you can help them. Please don’t just add people to groups or events & please don’t have your hosts do that either! Send them a direct message sharing about your group, the benefits you can provide and why you would like them for them to be part of it. Let them click to join the group (or party) if they are interested. Be respectful of people’s right to choose what groups they are in or what promotions they want to receive. When you are genuine, you share from the heart and truly care about helping others, you will never run out of people who need you and want your product. Scary Mommy and anyone else who feels how she does, I am very sorry you have had bad experiences and feel how you do. 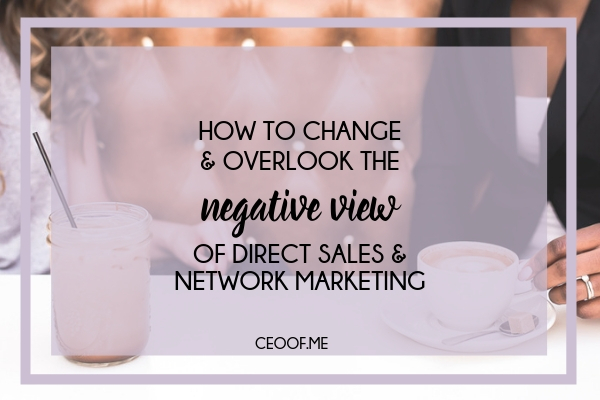 I hope you can look past those experiences and see that there are a lot of great direct sales companies and direct sales consultants out there. I sincerely hope that the direct sales reps who are being overzealous in sharing their opportunity learn how to become better marketers. Most of all I hope you can at least choose to just let others do what works for them and to support more women entrepreneurs instead of bashing and tearing them down. If the products, the party plan, the people you have interacted with so far don’t float your boat that’s okay but don’t try to sink someone else’s ship just because of it. I have read your blog in the past and there are few articles I really enjoyed. I don’t agree with how you choose to use the platform your blog has given you in this instance as well as a few others, but I would not ever try to cause harm to your blog or livelihood because I didn’t like how you did business. I wish you the best and as much success as is possible as I do for all home and online business owners. We are all marketers, marketing something. We all need to learn how to focus on serving others not selling and to use whatever platform we’ve been given or chosen to help rather than hurt. We are all women (and men) just trying to make an income, provide for our families and improve our lives through our chosen business path whether it be direct sales, blogging, writing, coaching or a brick and mortar store or business. Can we just try to support each other for wanting to better our lives and teach each other how to become better marketers, business people and human beings instead of tearing each other down & making it harder for us all? Thoughts & comments are welcome but please try to be kind to each other. If you enjoyed this post I would appreciate it if you would share it. Thank you! Thanks for sharing your thoughts- we need to train our teams and help others. It’s not about the quantity, it’s the quality of the relationships you make that builds a business. Beautifully said. I am just starting with my own business, Rodan snd Fields skincare…. I am touched by your words and will put into action your suggestions. Helping others in different ways is my #1 goal. Thanks Jeanine for your kind words!